For patients experiencing digestive troubles, one of the first things doctors will do is ask a series of questions to narrow down the list of potential diagnoses. One of the conditions on their short-list of conditions to rule out will often be Lactose Intolerance, which is the topic of today’s blog article. And remember, if you need a private gp London Doctors Clinic is here. What Is Lactose & Which Foods Contain Lactose? Lactose is a sugar that is found in milk and dairy products. If you have lactose intolerance, you may love dairy, but your body doesn’t, and it lets you know when you have too much! People who are lactose intolerant have an inability to digest the lactose in dairy foods, and this causes uncomfortable and distressing symptoms. An intolerance to a foodstuff is not the same as an food allergy, which can have a quick and potentially life-threatening response to a food or substance. Lactose intolerance is quite common in adults, and occurs more often in people who are of Asian, African and South American descent, rather than of European descent. How many people suffer from lactose intolerance is not truly known, but it is typically noticed for the first time in the late teenage or early adult years, and affects females more commonly than men. Lactose intolerance occurs due to a lack of an enzyme called lactase in the small intestine. The enzyme lactase is normally responsible for breaking lactose into smaller parts called glucose and galactose (which can be easily digested), so it makes sense that if you don’t have enough lactase you won’t be as able as other people to break down lactose found in dairy foods. The undigested lactose continues down through the small intestine and into the colon where bacteria work on the sugars in a process known as fermentation, which results in your unpleasant symptoms. Symptoms may vary a little from person to person, depending on how severe the intolerance is. 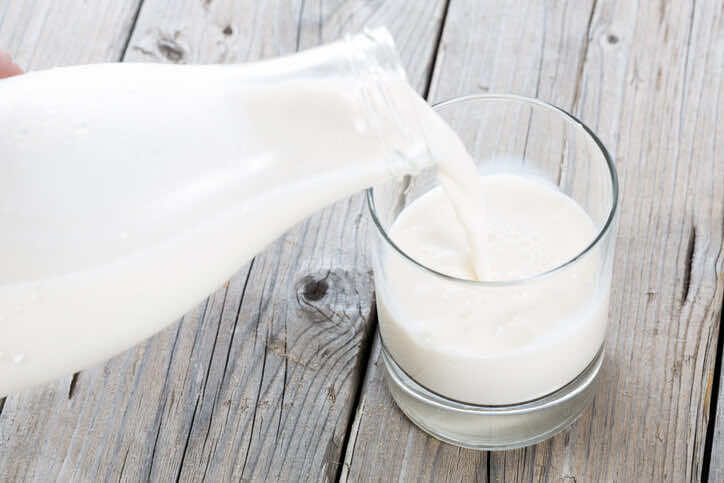 Some people can have a small amount of milk or other dairy without suffering disabling symptoms, but other people experience discomfort when they ingest even a tiny amount of food containing lactose. Symptoms tend to occur after ingesting dairy foods, and you may begin to feel uncomfortable between half an hour and two hours after eating. If you find that you are experiencing these symptoms, a great first step in helping yourself to feel better is to speak to your GP. In the time leading up to your appointment, consider keeping a food diary for a week or two. This will allow you to track what you eat and match certain foods to subsequent symptoms, allowing you to make important connections which you and your GP can use to help make a diagnosis. Conditions such as Crohn’s disease have similar symptoms to Lactose Intolerance, so a food diary will really help your doctor diagnose whether your symptoms are due to Crohn’s or Lactose Intolerance, or another condition. In addition to keeping a food diary, another great way to help diagnose lactose intolerance is to try avoiding dairy foods such as ice-cream, cheese, milk, and yoghurt for a period of time, and make note of any improvement in symptoms. If you want, you could try consuming some yoghurt or glass of milk after a week of abstinence, and if the previous symptoms return, you can say with some certainty that dairy does not agree with you! A more objective way to diagnose lactose intolerance is by performing a lactose breath test. This is a simple, non-invasive test performed after a short period of fasting, in which you drink a solution containing lactase and then blow into a bag, and the level of hydrogen in your breath is measured. Hydrogen is produced when undigested lactase in your intestine is fermented by bacteria, so a high level of hydrogen can mean you are lactose intolerant. However, in most cases this test is not necessary, and rarely performed by the NHS, as a good history including food diary is normally sufficient for the diagnosis of Lactose Intolerance. To absorb calcium, you need Vitamin D, so remember to include oily fish and eggs in your diet, and get outside for some bright light every day. Your Doctor may recommend that you add a calcium supplement to your diet, or visit with a dietician to ensure you know how to eat to receive the nutrients you need, while still enjoying a wide range of foods. If you do consume lactose and suffer the consequences, remedies from your local pharmacy, such as anti-nausea and anti-diarrhoeal medications will alleviate the symptoms, but the best treatment is still abstaining from the foods that cause you to feel unwell. You should talk with your doctor if your symptoms do not go away with treatment, if they get worse, or if you have other symptoms, such as a fever, chills, or severe belly pain or vomiting, as there may be an illness other than lactose intolerance affecting you. Or if you’re experiencing any of the above digestive symptoms for the first time, why not book a doctors appointment at London Doctors Clinic to discuss and further investigate such symptoms.